Abdul Samad Rabiu, the Executive Chairman/CEO of BUA Group has join company executives, investors and public officials, head of the financial institution and presidential economic advisor to chart a new course for Africa at the 7th Africa CEO Forum in Kigali, Rwanda. ECONOMIC INTEGRATION: Making the Single Market Work for Africa; H.E. Paul Kegame, President of Rwanda; H.E. 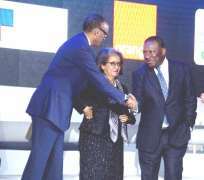 Sahle-Work Zewde, President of Ethiopia and Abdul Samad Rabiu, Founder/Chairman, BUA Group during the opening Plenary discussion of the 2019 Africa CEO Forum in Kigali, Rwanda.